From left Alec Mapa, Zion, and Jamison Herbert. Comedian and actor Alec Mapa has a one-man show on the Showtime cable network– “Alec Mapa: Baby Daddy” — where he jokes about the antics that ensured when he and husband Jamison Herbert adopted foster child Zion. 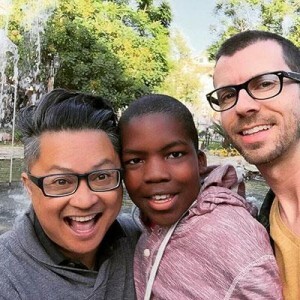 In a 2013 interview with SocialWorkersSpeak.org Mapa discussed the importance of social workers in helping him and his husband adopt Zion, including Robyn Harrod, MSW, from the Southern California Foster Family and Adoption Agency. It seems to me that it was a tough call for Robyn Harrod and the other social workers supporting the effort, all that I can say is “Wow”. I think that it is reasonable that people might be concerned for the adopted boy Zion in this transaction. I guess I’m wondering about the motivation of two homosexual men adopting a little boy; I can’t help that I have an imagination. Of course I don’t know either of these men and I certainly have no interest in casting judgments upon their lifestyle choices. As a student in Social Work, Psychology, and African & African-American Studies as well as a student of life; I am curious. What are your intentions with Zion, what will you teach him about life and the world? Will he be able to make an independent choice about his own sexuality and is that even possible when both of his parents, his role models, are men? There is no question that I think adults should be free to live their lives in ways that are appropriate to their values so long as this does not present the potential to cause harm to others. Having said that I am deeply concerned for the young boy involved here and I think that it would be irresponsible if I did not express that. I think it is a natural part of a person’s maturation in life to want to raise a child, regardless of one’s sexual orientation. I wouldn’t be concerned about his parents “forcing” homosexuality on their son. For all we know, both of these men’s parents tried to “force” heterosexuality onto them, so I would assume this couple would be extremely conscious of not “forcing” their son one way or the other because they would have first-hand experience being raised in that kind of environment. You seem very aware of not making premature judgements, but perhaps try to think as to why this situation would make you hesitant or uncomfortable. Consider, is it in the best interest of the child to be raised with two supportive parents, regardless of their sexual orientation, or remain in the state adoption system? Just remember, we can’t have our personal biases affect our work or judgement. I love love love what you said Nick, and I couldn’t agree more. Love is love and family is family. It takes a village to raise a child, but no one says what that village has to look like.